I cannot believe how long I have been waiting for this book, the third and final book in Katie Robison's Windstorm series. It has been 6 years since I was blown away with the first book, Downburst (read my review), where I likened Kit to Katniss Everdeen. And while Kit does whatever it takes to protect her family, Robison has created an entirely unique character all of her own. Robison is a fantastic story-teller; one who gradually draws you into the story until you are fully immersed into the setting and bonded with the characters. In a time when many books are claiming to be the next Hunger Games or Divergent, Robison takes the themes of these popular YA novels and adds her own twist. The biggest twist is one that is sorely missing in the publishing industry - diversity. The main characters in the series are part of tribal nations, ones that can trace their history back to the First People. I loved how Robison wove traditional mythos from ancestral groups into her stories. The parts often started off with a bit these legends. The Vila are female warriors in Slavic mythology who control the wind and create powerful storms with their songs. When they do battle, the earth shakes. But if a Vila's skin is touched by fire, she will die. Another twist - the story isn't set in the US or even really North America or the northern hemisphere, though in the first two books there are trips to Canada and Mexico. Most of the story takes place in or around New Zealand. I don't know about you, but I haven't read too many books set in New Zealand. 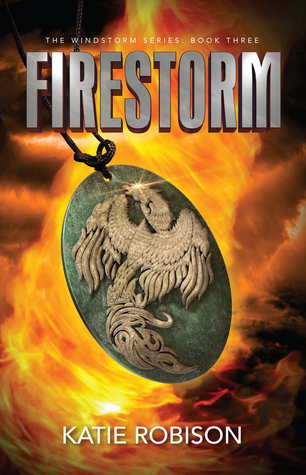 Robison really tries to give you an all sensory experience, but I thought there was an overabundance of adjectives in the opening chapters of Firestorm. It made the reading heavy in a way which made it difficult to really get into the story. I think partly it is sensory overload. You are trying to take in all the descriptions, which on their own are lovely, while at the same time recalling what has happened in the first two books. The last time I went two years between book releases in a series was when Harry Potter was coming out and before each release I re-read the previous books. Robison does provide some backstory in a not too recapping fashion, but it still made for a bit of a rough start. I knew I would eventually get sucked into the story and I couldn't wait for that moment, but I'm glad the story didn't jump right into the action. It gave me a chance to reconnect with the characters, which is important for some of the things that happen later. Fortunately, that is my only complaint. And if you haven't started this series yet it is the perfect time to since you can read through all 3 books back to back (be sure to enter the giveaway below!). 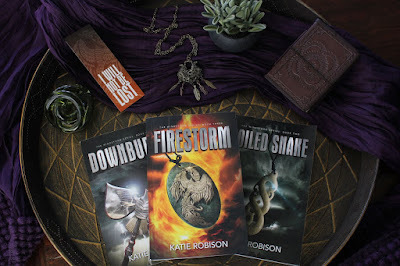 And if you have been waiting like me for the final book to come out, I highly recommend taking the time to re-read Downburst and Coiled Snake (read my review). I think it would make awesome summer reading for teens and adults a like. I'm thinking of buying the series for my niece to read this summer. It is a great adventure series that sneaks in some terrific life lessons about loyalty, friendship, love, and family. 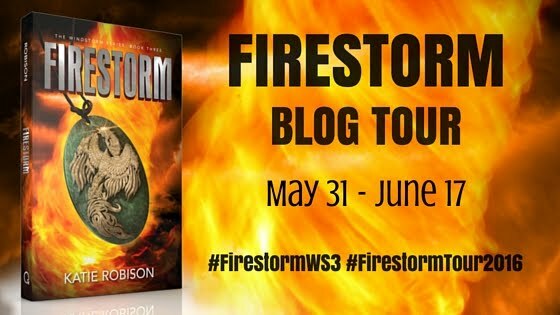 I don't know if I felt this way after the first two books, but towards the end of Firestorm I really started thinking how cool it would be to windwalk. Robison did a good job of wrapping up the story in this final book, but I have to wonder if it is the last we will see of the world she has created. The ending was satisfying in its conclusion, but there is definitely room for future novellas (if not full novels) or perhaps a spin-off series. I for one would really like to see at least a novella of a few years into the future. The books are young adult, but outside of the ages of the main character, it didn't really read like a young adult novel. It is a clean read and even though there is a lot of death, its not overly gory. On a side note, I have to say how impressed I am that Robison was able to publish 3 books while completing her Ph.D. and raising a family. Hats off to you, Katie! Katie is offering an awesome prize pack to one Girl Who Reads's US reader (for international readers, please visit Katie's website to enter her giveaway of ebooks). The prize pack includes signed PAPERBACKS of all three books, a necklace with a Chinese dragon, bookmark and leather journal. Donna Huber, founder & publisher. Donna is an avid reader and natural encourager. She is the founder of Girl Who Reads and the author of how-to marketing book Secrets to a Successful Blog Tour. She reads most genres, but her favorite books are psychological thrillers and stories that highlight the survival of the human spirit against unbelievable circumstances. Get even more book news in your inbox by signing up for our newsletter: http://eepurl.com/mHTVL. A free ebook was provided by the author for this review. Girl Who Reads is an Amazon advertising affiliate; a small commission is earned when purchases are made at Amazon using any Amazon links on this site. Thank you for supporting Girl Who Reads.